This morning, Ravens coach John Harbaugh went on a Baltimore radio station to say that the Patriots' championships have "asterisks" and that those titles have been "stained" because of Spygate. It didn't take long for Harbaugh to issue a statement clarifying his remarks to say he was referring to "the perception out there" that continues to linger about the Patriots because of Spygate. And by listening to the actual audio of Harbaugh's initial comments, which were said in response to a question about cheating in general (you can hear them here, beginning at the three-minute mark), it does sound like that was the point he was trying to make. "It's regret, it's disappointment, it's all of those things," Mangini said. "Because I know what it took to win those Super Bowls and I have so much respect for the people that were involved there. I'm disappointed that this is what it's translated into. "Never in a million years did I expect it to play out like this," Mangini continued. "This is one of those situations where I didn't want them to do the things they were doing. I didn't think it was any kind of significant advantage, but I wasn't going to give them the convenience of doing it in our stadium, and I wanted to shut it down. But there was no intent to get the league involved. There was no intent to have the landslide that it has become." "To have guys like Tedy have to defend the championships that we earned in New England, and to have anything taken away from the Kraft family, from coach Belichick, and the players and coaches that have meant so much to me, never in a million years did I think it was going to translate into what it was going to translate into," Mangini said. "And it doesn't tarnish what we achieved there. It doesn't tarnish what they achieved after the fact. I think when you look at the history of success that they had after that incident, it's pretty obvious that it didn't play any type of significant role in the victories we had or the success that we had." Let's keep in mind why any perception that the Patriots cheated still exists in the first place: They were caught doing something that necessitated an investigation by the NFL. 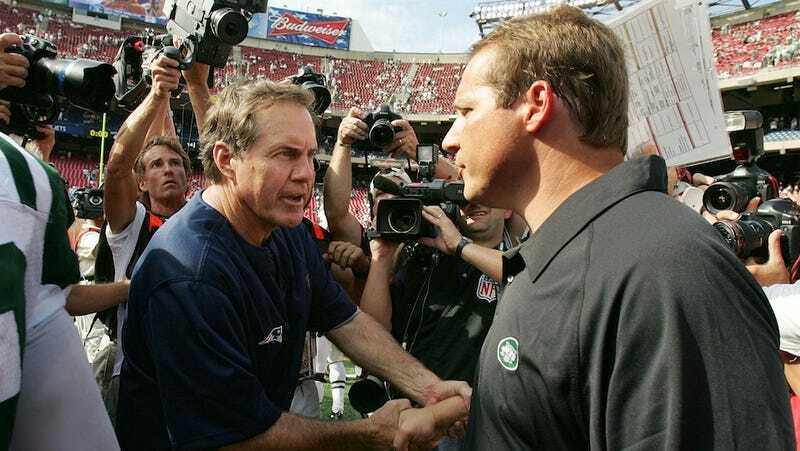 As a result of that investigation, the NFL fined Bill Belichick $500,000, and the Patriots were fined $250,000 in addition to having to forfeit a first-round draft pick. But then the NFL destroyed the tapes, thus preventing an outside, independent inquiry of what those tapes contained, and exactly how they might have been used. Maybe the Patriots cheated, maybe they didn't. But for many people, there's still a perception that they did. The NFL got rid of the evidence because they were hoping to make Spygate go away. Five years on, their decision has only ensured that it wouldn't.